Ben was kind enough to provide me with a free review copy of his latest download. In the present days of magic publishing – one-trick-downloads and unfinished ideas being published as highly priced e-books – it is really nice to see that Ben has published an over two-hour video download containing 5 solid pieces of magic, with additional thoughts and routines. The underlying theme, as the title suggests, is a set of 5 effects that use simple gimmicks. Ben takes you through the general idea behind the method. We then get into the DIY portion as Ben shows you how to build the gimmicks, and finally how to use the gimmick in a routine. The gimmicks are all simple in nature, and very easy and cheap to build, so if like me your arts-and-crafts ability is zero, don’t fear! We start off with Off Balance with which you can impossibly suspend items like sharpies, sunglasses, forks, and they can be borrowed and handed out afterwards for immediate examination. The display is almost that of the old Broomstick Suspension illusion and the gimmick reminds me of Mark Elsdon’s iBalance however this will work for other objects. As an aside over the past few years, for me, and the performing I want to do, I have really, really enjoyed reading Andy’s posts over at The Jerx blog. If you have never heard of this, where have you been! Andy is an anonymous writer, and writes about social magic and performing as an amateur, and the opportunities that affords. The reason I mention this here, is that one of the performance styles Andy recommends is something called The Distracted Artist, you can read about that in his Presentation Week post and also in his post entitled Return of the Distracted Artist. I can certainly see how I could use Off Balance in this scenario, just sat in a coffee shop and distractedly trying to balance my fork. This would be a perfect fit for this performance style and makes me excited to give this a go! The next effect SOS stands for Secured on Sharpie and is an easy ring flight where the spectators ring ends up duct-taped to the lid of the sharpie in your back pocket. This is a secure ring-flight and affords a very clean vanish. The gimmick is very easy to setup and construct and does most of the work. Ben also shows us a full routine where the ring appears and vanishes a few times before ending with SOS. For me until Dave Bonsall produced his excellent Ring Flight Revolution I wouldn’t consider using Ring Flight because of the hokey looking ring cases. SOS brings that organic feel back to the trick and uses an item you already have on your person as a magician. Stash is a gimmick you can use to hold-out a card or cards whilst the spectator shuffles the deck for example. The out-of-the-box thinking Ben has applied to come up with this gimmick is what makes this such a brilliantly simple idea. The cards can be loaded and retrieved with ease and the gimmick hides in plain sight, and takes up no pocket space. The one possible issue, if there really is one, is that this might be more suited to informal dress, but I am sure I can come up with a way around this. Ben provides us with a number of ideas for its use, including an Ace production, and a commercial use to make a message appear on the back of a card. The last two gimmicks involve Envelopes. Enveload is a super simple take on the Paul LePaul Envelope load, born out of necessity for Ben he has come up with a super simple way to create a sure-fire loading gimmick, for pennies, that can be used without having to buy expensive wallets or other devices. Again Ben shows us a routine with the envelope involving a signed card and banknote appearing in the sealed envelope. Finally Shadow Envelope is a way of shining your mobile phone flashlight through an envelope to show that it contains a prediction or folded card of some description, you can then cleanly remove the folded item, and show the envelope empty, yet you have switched in a signed card, or a business card with a thought of word written on. Again this gimmick takes minutes to make, and is simple yet effective. Ben’s Any Word prediction is a great way to use this envelope, under the guise of a gag mind reading effect you can then cleanly pull out from the envelope a card that contains the word the spectator said moments before, and show the envelope empty. But more than this Shadow Envelope is a utility that gives a strong convincing illusion to plug into your own routines. All in all the download runs 2 hours 15 minutes, and is simply shot, you see what you need to see for the gimmick construction, and because they are so simple to construct the DIY portion doesn’t take up too much of the video, leaving room for Ben’s thoughts, ideas and routines which are welcome additions. 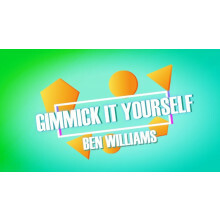 Gimmick It Yourself can be downloaded from Ben’s website for £15.